Your browser does not support the <canvas> element. Please use a different browser or click here if you are viewing this in an email. 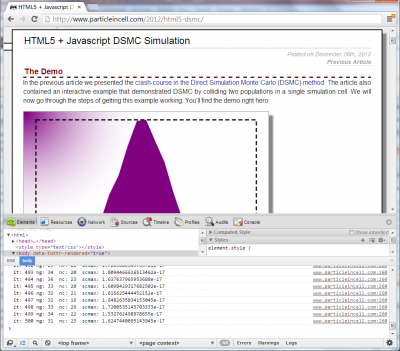 Before we get started, notice that the file is not a fully-enclosed HTML document. In other words, it does not have the <html> and <body> tags. This is to allow inserting this snippet into the blog post. If you are developing a stand-alone web-application, you will want to make sure to include these elements as well. The source code begins with a short notice which serves mainly as a pointer back to this page, in case you forgot where you got the source code from. Next, a canvas element is created. Canvas is one of the several additions in HTML5. You should not have any problem seeing the canvas unless you have a truly archaic browser. One exception however is email. Even modern browsers will not render canvas in email messages. Many people read this blog via the newsletter and as such, we want to include a link for them to click on to display the page outside of the email reader. We also set the dimensions and apply styling to the canvas. The styling consists of 1 pixel thick solid gray border complimented by a drop shadow. In the past, you had to utilize various “*-kit” alternatives to get the shadow working, but this no longer seems to be necessary. The translate shifts the origin (0,0) to the bottom left corner of the dashed rectangle. The coordinate (1,1) corresponds to the top right corner. The flip over the y-axis is done by scaling the y-direction by a negative number. Also, please note that this scaling is done after we finished drawing the dashed rectangle. The scaling affects everything, not just the position. Namely, it would affect the shape of the gradient as well as the spacing between dashes. Since our canvas is not a square, we would end up with different dash spacing on the horizontal and vertical faces had we applied the transformation earlier. Finally, we call the DSMC init function. This function is described below. This function takes in as an argument a 2D array in the form xy, with both components assumed to range from 0 to 1. For convenience, this array is split into two 1D arrays. The function then repaints the background using the previously saved bitmap. We then use the beginPath command to start plotting a linear trace. We move to the origin, and then create a bunch of linear segments to all (x,y) tuples from the input data set. At the end, we add a line to the bottom right corner and then back to the origin to create a closed polygon. This polygon is then filled with the fill style, which happens to be purple. The “constructor” takes as inputs drift velocity, gas temperature, and particle mass, and creates a random particle with an isotropic velocity sampled from the Maxwellian at the corresponding thermal velocity. The this. * construct is used to create inner members that hold the particle velocity and mass. Here we use two helper functions to sample the 3D Maxwellian distribution. The first step here is to clear the list. 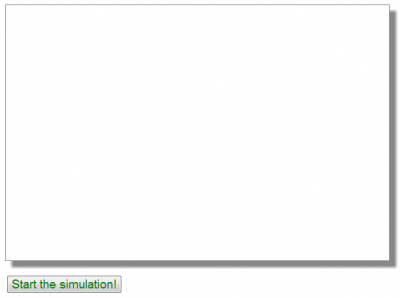 This is important since we give the user the ability to run the simulation repeatedly. Without this step, the particle list would grow with each click of the “Start Simulation” button! We create two populations, each consisting of 1000 particles. 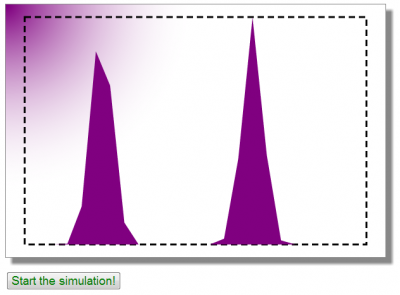 In a real DSMC simulation, you would have a much fewer particles per cell – likely no more than 100 total. However, here we use the higher number to obtain a smoother VDF plot. The particles come in two populations, one with drift velocity of 100 m/s and the other having drift velocity 300 m/s. Both are given initial temperature of 5K to generate a tight beam. This is quite cold, since for the relatively light molecular mass considered here, higher thermal velocities would exceed the drift speed. In a more involved example, we could get these parameters from a user form, but here for simplicity, they are hardcoded. But feel free to experiment with changing these values on your end. You may also want to change the ratio in particle counts between the two populations, this will influence the final average velocity. At the end of this function, we make a call to compute the VDF and to plot it. 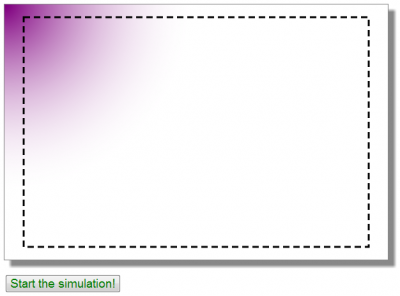 This will give us the initial view the user will see until he or she presses the “Start Simulation” button, which is plotted below in Figure 5. We first make a call to the init function. This is not needed the first time, in fact, we cheat here a bit in that the populations that will be collided will be slightly different than what the user sees on screen when the page is loaded the first timie. This could be avoided by, for instance, calling init only if the time step (it) is greater than zero – meaning the code had run previously. But for simplicity, this is not done here. We then call performDSMC, which performs a single step of the DSMC method. The code is shown below. It implements Bird’s DSMC NTC method. We first estimate the number of collision groups, and then perform that many collision checks. For each check, we select at random two particles, making sure they are unique. We then compute the relative velocity and obtain the cross-section using a simple inverse model. Note: this cross-section model was selected at random and is not supposed to be physically sound! The collision probability is then compared to a random number, and if the collision occurred, we call the collision handler. The collision handler is given below. It implements an elastic collision between two particles with isotropic scattering angle. The math for this handler is taken from Bird. We first compute the center of mass velocity, as well as the magnitude of the relative velocity (note, this could be passed in to optimize the code). We then sample two angles per Chapter 11 in Bird. These two angles are used to rotate the relative velocity into a new coordinate frame. Finally, the velocities of the two particles are adjusted. As an aside, this model implements isotropic scattering. However, in reality, non-isotropic scattering models tend to be more accurate descriptions of what happens in molecular collisions, especially in the field of plasma ion momentum transfer collisions. Hence in a real simulation, you would want to select the theta angle from the differential cross-section. This function returns a 2D array consisting of “velocity” and the “bin” count. Both fields are actually normalized. The velocity array is assigned linearly increasing values in the range of 0 to 1. The bin counts are also divided by the maximum bin count, also yielding data in the range of 0 to 1. This normalization is done to simplify the visualization. The console is normally hidden, but you will find it under “inspect element” right click menu in Chrome, or “Developer Tools” in Internet Explorer. The console will show you the number of groups, number of collisions, and the sigma_cr_maax parameter determined for each time step. 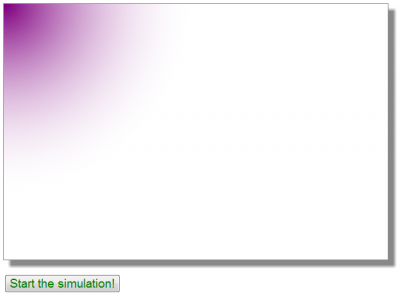 After the plot is made, the simulation time step is incremented. As long as the time step is less than 500 (the maximum number of time steps), the function then adds a timeout to call itself again in 10 milliseconds. And that’s all. Feel free to leave a comment if you have any questions or something is not clear. For more interactive demos, make sure to check out the SVG mesh generator, write up on smooth Bezier splines, and the article on HMTL5 plotting.